The St. Louis Cardinals have been blessed to have two of the best pitchers in Major League Baseball throughout the past seven years. Unfortunately, they rarely got to see that blessing in full effect. The Cardinals announced Tuesday that Chris Carpenter won’t pitch in 2013, which likely ends his career as a player for the Cardinals. It also ends a very successful era that still could have been exponentially better without injuries to Carpenter and his co-ace Adam Wainwright. The Cardinals won two World Series titles and made the playoffs in four of the seven seasons Carpenter and Wainwright were both on the roster. That is arguably the most success any franchise has had during that time. The San Francisco Giants won just as many championships, but they only made the playoffs those two seasons. The New York Yankees made the playoffs in six of those seven seasons, but they won just one World Series. Still, the Cardinals had all of that success while rarely having Carpenter and Wainwright healthy at the same time. The only years both pitchers were able to be on the mound regularly during the same season were 2006 (although Wainwright was in the bullpen as a rookie), 2009 and 2010. One of the two pitchers was on the disabled list for an extended period of time in those other four seasons. Most of the injuries happened to Carpenter. He led the Cardinals onto the field on Opening Day 2007 against the New York Mets and gave up five runs in six innings as the Cardinals lost 6-1. They would go on to finish 78-84, good for third place in the NL Central. Wainwright moved into the starting rotation in 2007 and compiled a 25-15 record over the course of the next two seasons. But Carpenter didn’t return until 2009, which also happened to be the next time the Cardinals returned to the playoffs. Carpenter and Wainwright combined for a 72-32 record in 2009 and 2010, the first time since 2006 the two pitchers were both healthy at the same time. 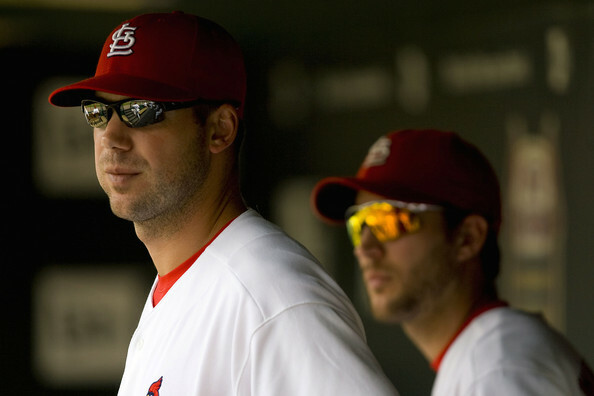 The Cardinals won 91 games in 2009 and 86 in 2010, but then injuries destroyed the dynamic duo once again. Wainwright blew out his elbow in the opening days of spring training in 2011 and missed the entire year after having Tommy John surgery. Carpenter picked up the slack that season with an 11-9 record that betrays his 3.45 earned-run average and his leadership that led the Cardinals to the World Series. He won the playoff-clinching game on the final day of the season in Houston, Game Five of the division series in Philadelphia and Game Seven of the World Series against the Texas Rangers. Coming off the championship season, the Cardinals hopes were high that they could repeat because Wainwright would be back, and the team would have its two best pitchers healthy again. Then Carpenter started to feel discomfort in his next during spring training workouts. He wouldn’t make his first start of the season until Sept. 21. The Cardinals still did well last year and came within one win of reaching the World Series again, but Carpenter struggled against the Giants in the National League Championship Series. He didn’t make it beyond the fourth inning in either of his starts, and his arm wasn’t fully healed. So while the Cardinals’ announcement that Carpenter wouldn’t be able to pitch this season wasn’t terribly shocking, it still closes the book on one of the most successful eras in franchise history. But despite that success, the franchise and its fans will close that book wondering how great those teams could’ve been if their two best pitchers hadn’t so often fallen victim to injuries.